The hero of The Ghost of Africa is Dr. Paul Branson, a tall, handsome, rugged man with a heart of gold. A prominent New York City trauma surgeon, Branson’s life is turned upside down when his young wife, Nicki, dies of cancer. Paul and Nicki had been living a dream together—working to help the poor in the African bush by setting up medical clinics and providing clean water, food, and medications. Paul’s twenty-year-old daughter, Jessica, still lives in New York to begin attending law school. We’ll meet her in a few days. As Paul returns without his wife to help a young girl named Leza, he is abducted by the LRA and taken captive for reasons he will soon discover. The windshield of the jeep Paul hid behind splintered into tiny fragments as the bullets passed through. Bark exploded off the trees as the thud of hot metal split their trunks. Pure adrenaline coursed through Paul’s veins. Paul is stretched to the limits of his strength, his resolve, and his faith. He must rise to the occasion and discover within himself the power to overcome, and the determination to forgive. Branson’s struggles are physical, emotional, spiritual and very real. 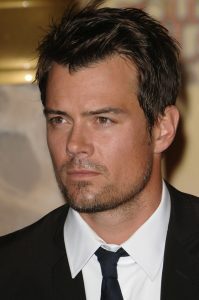 The person that most reminds me of Dr. Paul Branson is Josh Duhamel pictured above, known for his role in Transformers and many other movies. [Photo Credit: Bob Charlotte / PR Photos]. The Ghost of Africa is available from Amazon now.